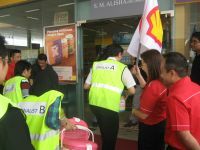 Shah Alam, 29 May 2013 – Twelve Malaysian motorists gathered at the Shell Station located at Batu Tiga (Klang bound) to compete for cash prizes totalling RM500,000 at the Grand Finale of Shell Select stores’ recent “Shop to Win” Contest. 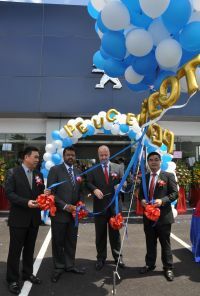 Kuala Lumpur, 28 May 2013 – As part of its on-going nationwide network expansion exercise, Nasim Sdn Bhd today launched its latest outlet in the country, Peugeot Blue Box Batu Pahat. Kuala Lumpur, 27 May 2013 – Scania (Malaysia) Sdn Bhd, a leading manufacturer of heavy trucks, buses and coaches, marine, industrial and power generation engines, announced that it has just secured a 360-city bus order from Syarikat Prasarana Negara Berhad (Prasarana). Shah Alam, 23 May 2013 – It was an unforgettable weekend for 500 invited Toyota merit members and their guests in Klang Valley and Kuching, Sarawak when they were treated to a get together session while enjoying the Sci-Fi movie, Star Trek into Darkness. Toyota Merit Programme is an exclusive, by invitation-only created specifically to reward Toyota’s loyal customers and merit Movie Day is one of the privileges awarded to members. Kota Bharu, 21 May 2013 – Scania (Malaysia) Sdn Bhd, a leading manufacturer of heavy trucks, bus and coach chassis, marine, industrial and power generation engines, today announced the official opening of its new Kota Bharu branch office in Kelantan. Covering an area of approximately 1,800 square meters, Scania’s new Kota Bharu branch comprises a spacious new office for sales and administration; while its workshop for repairs and maintenance – staffed by a team of six skilled Scania technicians - can serve up to 10 Scania trucks or buses per day in accordance to Scania’s highest standard of quality and safety. Shah Alam, 16 May 2013 – The Toyota Camry, Malaysia’s most popular executive sedan over the past 6 years (2006 – 2012), has been updated and improved for 2013. 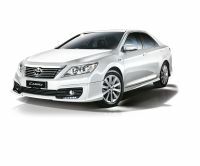 The current generation, launched in Malaysia last year, is assembled locally in three variants – Toyota Camry 2.5V, Toyota Camry 2.0G, and Toyota Camry 2.0E. Customers can choose from four exterior colours: Attitude Black, Silver Metallic, Medium Silver Metallic and White Pearl CS. Kuala Lumpur, 15 May 2013 – The much awaited new D-Max was today unveiled to the local media, invited guests and dealers in the presence of Katsumasa Nagai, Director of the Board and Senior Executive Officer, Isuzu Motors Limited, together with Kimitoshi Kurokawa, CEO, Isuzu Malaysia Sdn Bhd. “What the original D-Max did was to set exceedingly high standards in durability, reliability and fuel efficiency. 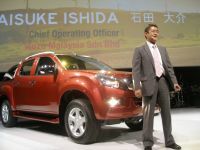 With the all D-Max, the engineers have not only enhanced these core features, the entire package including comfort, safety and performance have also been elevated to new heights,” said Kimitoshi Kurokawa. Shah Alam, 9 May 2013 – Volvo Trucks Malaysia is back once more with its annual Fuelwatch challenge, seeking to find Malaysia’s most fuel efficient trucker to pit against the world’s best in a fuel efficiency contest that judges and more importantly, teaches skill, concentration, knowledge, and discipline. Kicking off the first of six preliminary rounds in Shah Alam on 30 April, participants will be put through a series of trainings and briefings all the way until the end of June. So far 350 truckers from 63 companies have registered to participate in the challenge. Following the launch, Volvo Malaysia will proceed with a road show across the country covering Johor Bahru, Prai, Kuantan, Kuching, and Bintulu. This year’s challenge is unique as together with the competition, it makes the Globe Truckers Carnival a pan Malaysia affair. Petaling Jaya 9 May 2013 – Honda Malaysia Sdn Bhd today announced that the Civic Hybrid is now equipped with a Rear Reverse Camera and Hands-Free Telephone (HFT) System capability. With the new Rear Reverse Camera, safety and assistance in parking is enhanced by eliminating blind spots while reversing. Additionally, the HFT System eases answering and making phone calls while driving. These new added features are integrated with the Civic’s intelligent Multi-Information Display (i-MID), which enables drivers to access the information without taking their eyes off the road. 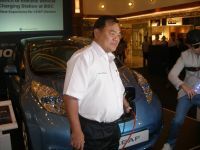 Kuala Lumpur, 8 May 2013 – Edaran Tan Chong Motor Sdn Bhd (ETCM) and First Energy Networks Sdn Bhd (FEN) have teamed up with Bangsar Shopping Centre (BSC) to build an Electric Vehicle (EV) charging station with equipment supplied by General Electric (GE).